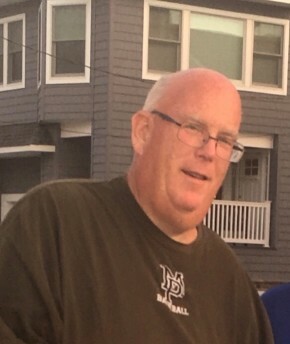 Robert “Jay” James Esposito, 53, of Rochelle Park, NJ passed away suddenly on Thursday, April 19, 2018. Born in Ridgewood and raised in Midland Park, he resided in Rochelle Park for 20 years. An active member of his community who volunteered countless hours, he served as the former Board of Education President of the Midland School in Rochelle Park, coached Little League, soccer and basketball and was the DJ for town functions. A graduate of William Paterson University in Wayne with a degree in film and technology, he was a teacher with the Midland Park Board of Education for 30 years where he coached numerous sports. He was the manager of the Mahwah Pool and the former manager and director of the Woodcliff Lake pool. Beloved husband of Colleen (Keenan) Esposito. Loving and devoted father of Gabrielle Esposito, the light of his life. Cherished son of Carol (Chapman) and the late Robert Esposito. Dear brother of Keith Esposito and wife Colleen and brother-in-law of Kevin Keenan, Brian Keenan and wife Christina and Gary Keenan. Dear son-in-law of Joan Keenan. Loving uncle of Katie, Caroline and the late Jack Esposito and Victoria, Dillon and Derek Keenan. He is also survived by his dear friends who brought him much joy and laughter – Danny and Jeannie Rogers and daughter, Kayla; Mark and Monica Scully and children, Matthew, Ryan and Caitlin and Barbara Marsh and son, Brendan. The family will receive relatives and friends for memorial visitation on Sunday, April 22, 2018, 2-6 pm at Vander Plaat-Caggiano Funeral Home, 13-31 Saddle River Road, Fair Lawn, NJ, 07410. A funeral mass is planned for Monday, April 23, 2018, 10 am at Sacred Heart Church, 295 Rochelle Avenue, Rochelle Park, NJ. In lieu of flowers, donations in memory of Jay to the education fund of his daughter, Gabrielle would be appreciated. Please make checks payable to Colleen Esposito and mail to Mrs. Colleen Esposito, C/O Vander Plaat-Caggiano Funeral Home. I am so very sorry for your loss. Jay was such a great guy who I saw every morning while heading towards my office. and then during the day really going to miss seeing him. he would tease that he was babysitting but you can tell he loved being with the kids. Gabby was his favorite subject. It didn't take much to see his smile all you had to do is say how is Gabby??? and you would get an instant smile . My heart breaks for you and your family. Jay was incredibly kind, generous, funny and full of life. It was our good fortune to have known him and a privilege to call him a friend. We are truly heartbroken for Colleen, Gabby, Carol and the rest of his family. He will be missed by many.